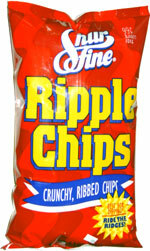 Taste test: These wide-rippled chip were thick cut, very crisp, not greasy, moderately salty, and had a very good potato taste. There were many large, unbroken chips in the bag. Good stuff! Company: Western Family Foods, Inc.